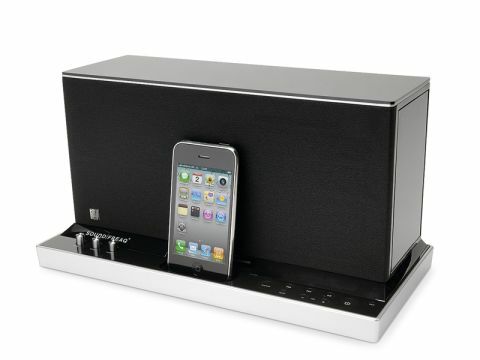 Can Sound Freaq make a name for itself in the iPod dock market? According to SoundFreaq, the SFQ-01A is built with three objectives in mind: performance, experience and design. So that's how we'll judge it. Its performance is acceptable given the price, but it's far from outstanding. Audio is complete and detailed, but not as broadly shaped as we'd like. A feature called 'U-Cubed', or UQ3, uses a proprietary technology to widen the sound, making the custom-built drivers seem further apart than they actually are. It does make a difference, but it's not as effective as Altec Lansing's similar ESS function. You can manually adjust the bass and treble, but not by much, and this feature doesn't work at all when UQ3 is switched on. As well as docking your iPod/ iPhone or using the 3.5mm AUX-in socket to listen to non-Apple audio players, you can transmit your sounds wirelessly from any A2DP-capable Bluetooth device. Pairing is easy, and it's great for streaming from your Mac or iPad, or for keeping your iPhone or iPod touch to hand while listening to your music. There's an app to turn your iOS device into a remote too. But the SFQ-01A's design is underwhelming. There's some neat touches, like the door on the side of the unit that houses the hand controller, but with its blocky design and fingerprint-hungry shiny plastic finish, it's certainly no great looker. SoundFreaq's device offers decent quality for the price, but there are better docks at the £200 mark.